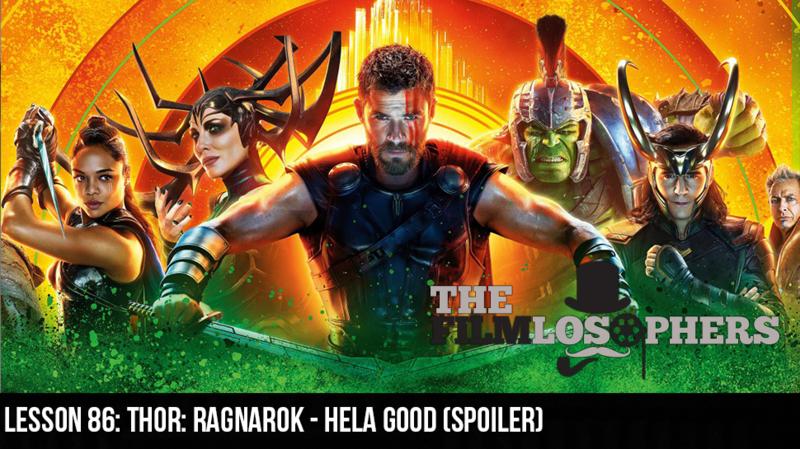 The Filmlosophers, Eddie Villanueva and Chad Riley, The Filmlosophers tour the spaceways and spar with the gladiators of Sakaar in this week’s spoiler review of Marvel Studios’ latest release, Thor: Ragnarok (2017). Starring Chris Hemsworth, Tom Hiddleston, Idris Elba, Anthony Hopkins, Cate Blanchett, Tessa Thompson, Jeff Goldblum, Karl Urban and Mark Ruffalo, the film marks the MCU debut of acclaimed New Zealand director Taika Waititi and has the gods of Asgard facing their own end at the hands of Marvel’s first female boss baddy, Hela. Chock-full of teases, character deaths (it is Ragnarok, after all) and cinematic Easter eggs, the film moves the Asgardians’ storyline forward by leaps and bounds…and let’s not even talk about the cameos. This rollicking cosmic adventure truly has a lot to love, even after Thor’s hammer falls to pieces.